Thanks to our readers we can show you the Faststamps output from Spring Stampex even better than if we were there ourselves! Thanks to Chris, Brian, and John for these pictures. We don't have these yet, and most of our stock was pre-ordered by regular customers. If we have stock for sale a link will be provided in the blog. 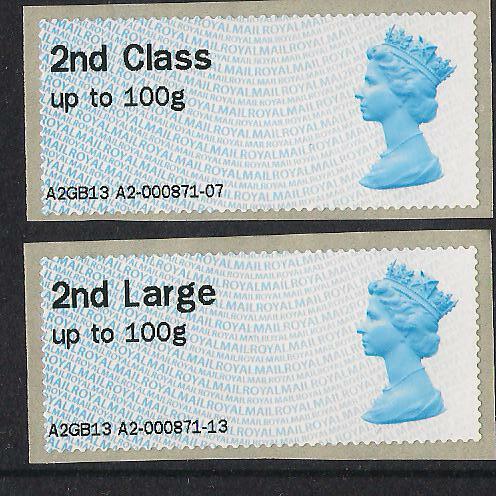 c. From machine A3, with the pair from the Bureau Pack for comparison. The second line of text is indented on the Bureau pack. 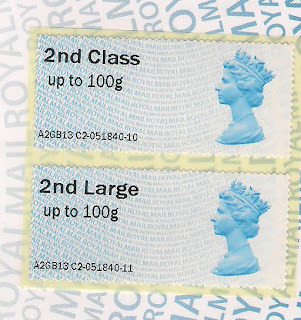 It still isn't centred below the first line, so it's unclear what the actual format is intended to be, if indeed there IS a 'right' way. 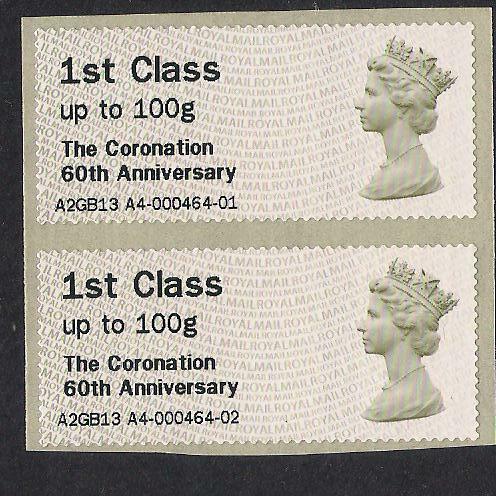 And the year code is MA12 in the line leading up to the Queen's forehead. Coronation overprint, with receipt, and then 1st class from machines A3 and A4. 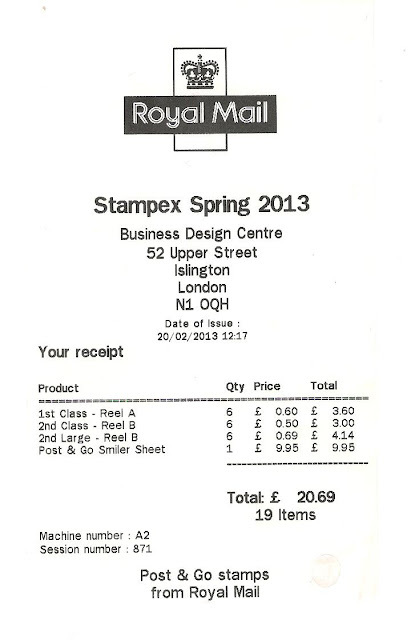 Receipt showing purchase of Faststamps and Stampex Smilers Sheet. John writes: "All three kiosks offer the option for a special Stampex Smiler sheet. - Pay via kiosk then see staff member who takes your photo for addition to sheet using i-Pad which then downloads to colour printer. The process takes about a minute." This is probably using the Smilers App developed by IntelligentAR referred to in an earlier post. 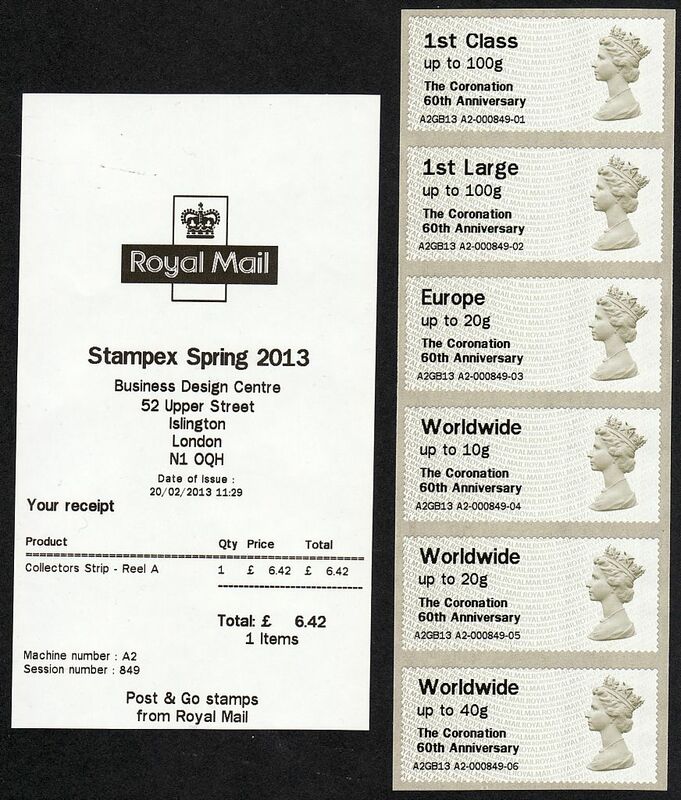 We've also been sent a picture of part of the Sheet, which shows that the captured image is only applied to 9 labels, with the 10th having the Stampex logo. I have a regular order for Bureau Packs. They did not arrive so I rang to enquire. "They have decided to send them out with the Fershwater Life Packs". Handy for doing FDC's. 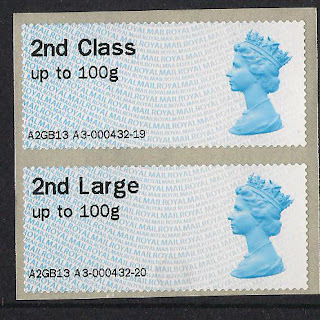 I know I can still get postmarks at Handstamp Centres but it wold be nice to know what is going on and cds postmarks are impossible. I could have done the FDC's in the time it took to find out what had happend to the packs. It would certainly be helpful if Tallents House made it clear that they were going to send stamps out in batches. 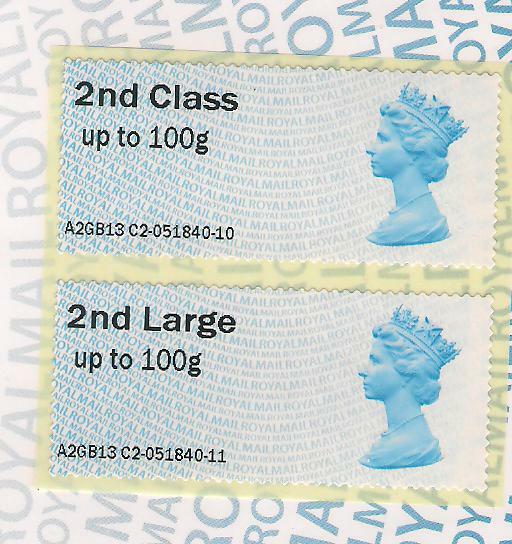 As you say, this means that you cannot get a first day cover with from a post office branch handstamp. I assume they are sending today's Jane Austen issue out tomorrow as well! 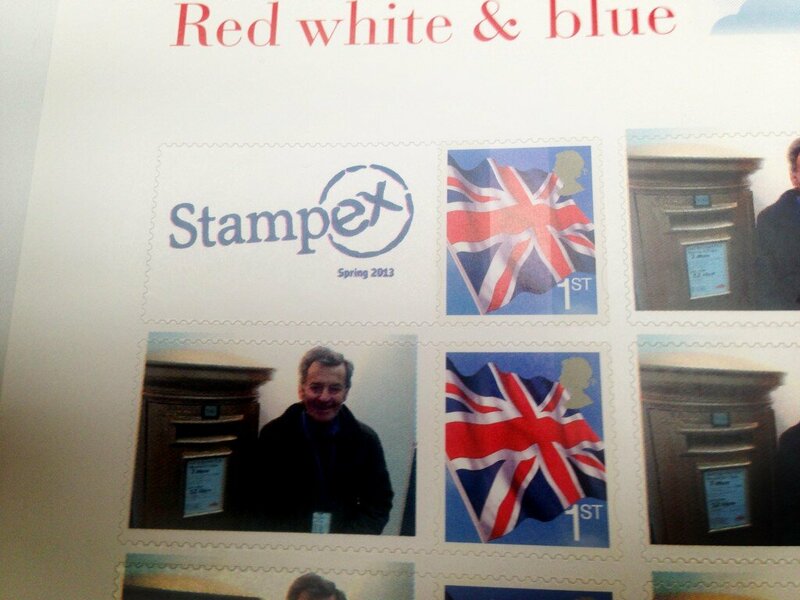 I would advise anybody who wants to be sure of having the stamps delivered on the day of issue to make that absolutely clear to Tallents House in advance. Of course if you have a standing order, you assume that that is exactly what will happen. 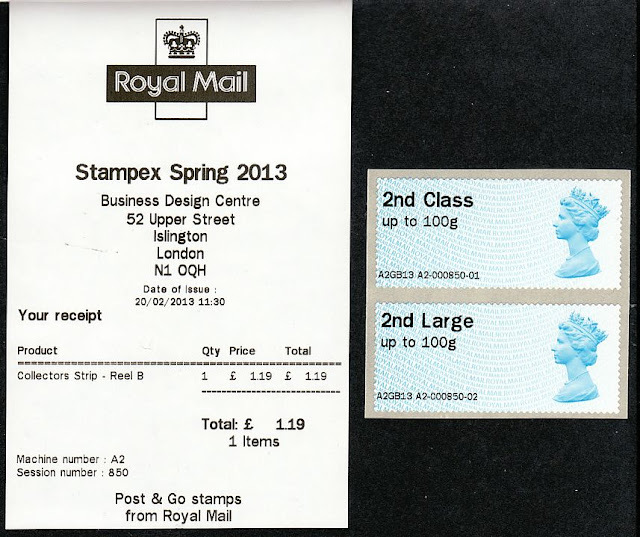 I would be especially sure to emphasize this in September, when there will be more than one stamp issue during Stampex. I have 2 settings for the Stampex Coronation overprint from B1 back office machine. 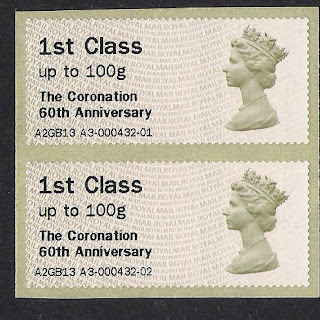 On the Collectors strip the words "The Coronation" are inset to the right from the words 60th etc on the line below. 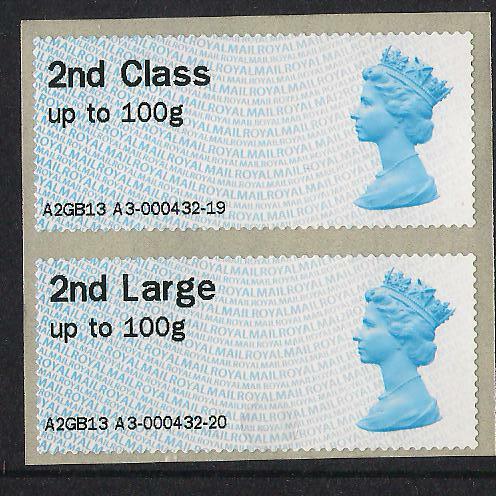 On the a strip of 6 first class the two lines of text are level -as is the Collectors strip from machine A2. 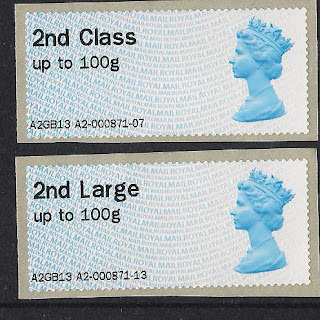 Looks similar to the earlier 2 settings on the Stampex Diamond Jubliee Flags overprints except the inset is on line 1 and not line 2. Hey ho another variety to look out for!